My main focus now is helping clients release low-back and shoulder pain through stretching. I took my first yoga class in 2000 during MBA school and immediately saw the long-term benefits. I loved the way the class made me feel even though I had no experience and very limited flexibility. I started a regular 5x per week practice while working in Latin American import/export and, in 2007, decided to take a 9-week, residential teacher training with my wife and 300+ other yogis in Hawaii. After apprenticing for 2 years in Miami Beach we opened our own studio in Coconut Grove in 2009. Since then, I have taught over 37,000 individuals in over 2,200 classes! I also lead Office Stretching sessions for clients including American Airlines, BBC Worldwide, and Miami-Dade County Employees. Growing up Courtney always knew she wanted to follow in her mom's footsteps as a group fitness instructor. In 2010, Courtney took her first hot vinyasa yoga class, fell in love, and knew that this would be how. In 2014 Courtney traveled to Lima, Peru to emerge in the 200 hour RYT certification with Fred Busch. Once she returned from her training she became a full time yoga instructor! A couple years after Courtney began her journey into the Interior Design world, making her long time hobby her career while still finding balance on the mat! 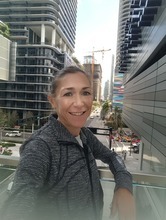 Kelly Moumdjian is a 200-hour E-Registered Yoga Teacher, Pilates instructor, and fitness coach with a background in Adult Learning and Neuropsychology. Her creative sequences allow practitioners of all levels the freedom to play their edge and are filled with core work, arm balances, twists and inversions. She infuses playfulness into her classes and an approach that inspires you to practice yoga every day to change your body and expand your mind. Follow her on IG and Facebook at kellymoumdjian. Come prepared to sweat and have fun! Mary Margaret fixed her chronic knee pain with Bikram yoga and loves helping others use yoga for healing and therapy, too. It sometimes makes her more patient with her three kids and Will. In addition to teaching at the studio, Mary Margaret teaches yoga and wellness full time at a K-12 school. Raquel or as her friends & family call her 'Keli', has been involved in fitness since her early days. Dance classes & growing up by the beach always inspired her active lifestyle. Keli felt a strong passion for fitness, teaching, spinning and step aerobics in the 90's in her hometown Puerto Rico. After relocating she continued teaching at fitness chains in South Florida. Once She incorporated her production company Keli, Inc; she spent years in the entertainment industry traveling and working on production sets daily with no time for her health & fitness. She experienced the downfalls of how a stressful work and lifestyle took a toll on her mind and body. After two major knee reconstructive surgeries, Keli found herself disabled for a couple of years until she was introduced to pilates as the rehabilitation therapy that got her back to walking again. At this turning point of her life yoga was her savior and Bikram Yoga became her obsession, in which she found real healing inside out. Since completing various Teacher Trainings, Keli has been dedicated to teaching several forms of intense trainings like Hot Pilates, Barre Intensity and Power Fusion as well as more calming and stretching modalities like Yogalates, Yin Yoga and Meditation. Keli is also a Wellness Advocate for Natural Healing and a Reiky Practitioner. It has been a long road of physical/mental recoveries for her to get to this point so she is very careful that her classes are low impact on the joints and muscles therefore improving overall health for the long haul, not just a quick fix. Keli always strives for expanding her knowledge and teachings of natural healing and fitness methods and inspires everyone who attends her classes to never give up and awaken their awareness to the of the body, mind & soul connection!